I realize the title of this post is a bit presumptuous on my part; after all, like anything having to do with the arts, music is subjective and what I think is great is certainly not going to be what everyone else necessarily likes. However, I think I'm safe in assuming that even if you don't agree that the songwriters I'm about to write about are the four absolute best of all time, I think I'm correct in saying that they are unarguably amongst the best. Now that I've gotten that out of the way, let me get to the crux of what follows. If I were to create a Mt. Rushmore of who I consider to be the four greatest songwriters of their generation, as well as four of the greatest of any generation, and whose reach and influence extends all the way to the present day, I don't think I could do better (and I certainly could do a lot worse!) than the four I've chosen. As seen above, they are Paul McCartney and John Lennon of the Beatles, Ray Davies of the Kinks, and Pete Townshend of the Who. 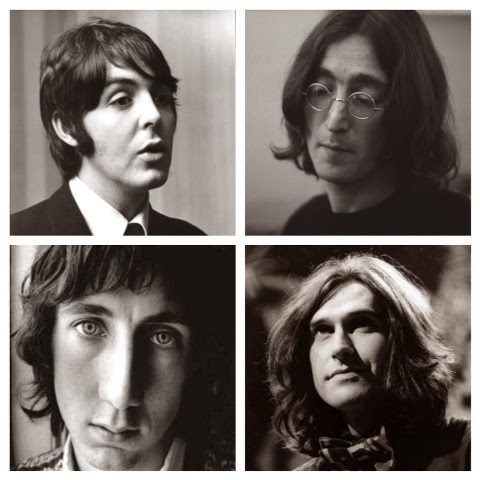 Each of them has, in their own way, had an enormous personal influence on me on an emotional level as well as on how they've inspired and influenced my own songwriting, guitar playing, and lyric/prose writing. I was born too late to have experienced their work as it was being created and released (apart from the Kinks, who continued to put quality new material out into the 1990s), but I am a staunch second-generation fan of all of these bands, having been listening them literally from birth thanks to my parents. I'll warn the reader upfront that as I go through and write about each of them, I am going to make an effort to be somewhat subjective, but at the same time I make no apologies for readily injecting my own personal feelings about these writers and their music into each section. Also, I cannot stress enough that, while each of them are brilliant writers and musicians on their own, each of them were blessed with the perfect musicians in their respective bands, fellow musicians who shared their vision and who fleshed out and expressed their musical ideas. The members of the Beatles, Kinks, and Who were talented and essential musicians in their own rights who added their own personalities into the songs written by these giants and without whom the songs we know and love would not sound a fraction as great as they do. I have to write about them together, because even though they were (and in Paul's case, still is) supremely talented and wrote numerous great songs as individuals, they both created the best work of their careers together as a team. 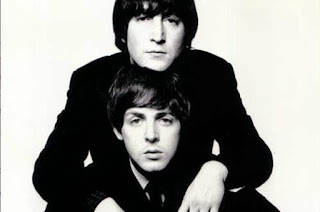 Lennon/McCartney remains one of, if not the most successful songwriting partnerships of the 20th century and one of the greatest that ever was. It was a perfect blend of their individual musical talents, personalities, creativity, and competitive instincts that was held together and driven by ambition, self-belief, and the deep personal friendship and mutual love and respect they had for each other. They both brought to their friendship and partnership the experiences they had growing up: John was a good soul who was very angry, confused, and cynical about the world due to his very strange and oftentimes traumatic childhood: abandoned by his parents Julia and Freddie and left to be raised by his aunt Mimi and uncle George when he was a small child, he grew up in a comfortable middle class household in Liverpool. However, a series of events shaped his outlook on life by the time he reached young adulthood: his beloved uncle George died when he was a child, and his mother came back into his life and John grew closer to her and his step-sisters. However, John had several rows with his strong-willed aunt Mimi who disapproved of the freewheeling lifestyle of her younger sister. Julia sparked John's love of music, showing him how to play his first chords, as well as encouraging his wacky sense of humor and love of creative wordplay and art. Tragedy struck when she was struck by a car driven by an off-duty policeman and killed just a block from Mimi's house when John was 17. Friends and family noted a hardening in his personality, which persisted all the way through to the early Beatles career. The cynicism never completely left him, though, and his well-known issues with authority figures and his complicated emotional needs, especially as relating to the women in his life, persisted through to the end of his life. By contrast, Paul, who became best friends with John in 1957 when John was 17 and Paul 15, had a much more stable upbringing for the most part. Although his mother died from breast cancer when Paul was 14, he and his brother had a hard-working and loving father, not to mention numerous aunts, uncles, and cousins who all pitched in to help raise the boys. And while John's aunt Mimi was dismissive and generally unsupportive of his musical ambitions, Paul's father Jim was a musician himself and nurtured Paul's talent as best he could. John tended to be more cynical and suspicious of the world in general, while Paul was more of an optimist and a charmer. It was these two disparate personalities that formed a deep friendship in 1957 and would serve them in good stead when they started writing songs together shortly thereafter. The brilliance of Lennon and McCartney is the fact that they had each other as collaborators. Both men were incredibly talented and would have undoubtedly been successful on their own. But together, they merged their individual strengths, covered for each others weaknesses, served as quality control for one another, and pushed the other to produce work of ever increasing quality. 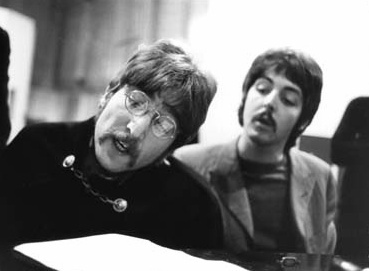 In the earliest days, they wrote most, if not all of their songs together, working "eyeball to eyeball" and "in each others noses" as John has said. While the rule was that the main composer sang lead on all Lennon/McCartney-penned Beatles songs (with a few exceptions), the early music they created was undeniably written together. Whether it was John critiquing Paul's original lyrics for "I Saw Her Standing There," Paul stumbling upon the chord in "I Want to Hold Your Hand" that excited John so much that he shouted out "that's it! Play that again!" and of which he later said "made" the song, and the general spirit of collaboration when they sat down to write together, the whole of their partnership was greater than the sum of its parts. From around 1965 until the end of the band in 1970, they began writing more individually, oftentimes bringing nearly completed songs to play for the other when they'd meet for their writing sessions. However, the input of the other was still invaluable, whether it was in assisting with the lyrics, completing an unfinished section, helping with an arrangement, or adding a song fragment the other had written and stitching two (or more) song ideas together into a cohesive whole. Examples included "A Day In the Life," "We Can Work It Out," "Hey Jude," the entire Abbey Road medley, and many more. Even though both men continued to write music after the Beatles' split, varying in quality from good to great (and much of Paul's post-Beatles output is among my favorite music of all time), they unarguably produced their best work together between 1962 and 1970 during the Beatles' career. In addition to the reasons mentioned above, they were each others biggest fans and critics. The quality control they offered to one another kept each man's individual weaknesses in check and pushed them to greater heights. Oftentimes it was John keeping Paul's more ambitious arrangements, song suites, and overly sweet melodies in check; other times, it was Paul pushing John to write more melodically and to make his lyrics a bit more accessible. They had very different styles: John tended to write in a more horizontal manner, whereas Paul tended to write more vertically. 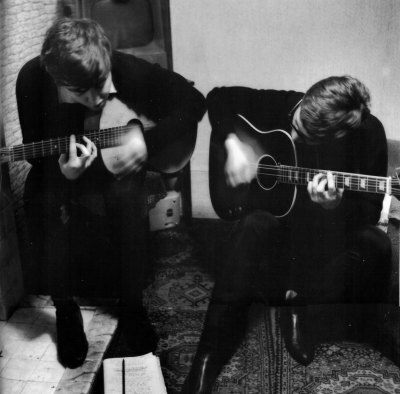 John's lyrics were almost always more personal and emotionally bare, while Paul's lyrics were more obscure and he tended to couch his emotions under layers of words. However, the prevailing wisdom that John was the "rocker" and Paul the "balladeer" is easily discarded; one only has to listen to them both writing harder rock songs (Paul's "Helter Skelter" and John's "Revolution") and beautiful melodies (John's "This Boy" and Paul's "For No One"), among numerous examples, to see that both had their own approach to writing in any style, but together they made something truly magical. As for the music itself, why has it been so popular, effective, influential, and far-reaching in its impact? The obvious answer is because, first and foremost, the songs are great: they're catchy, inventive, engaging, and timeless. As a duo, Lennon and McCartney had melodic gifts that created some of the greatest songs ever written. Beyond that, lyrically they communicated in a very direct and engaged manner and they were able to get their message across in a variety of ways. Whether it was via more cerebral devices, simple singalongs, metaphors, or direct conversation with the listener, they always got their message across effectively. One of the reasons for this, as explained in later years by Lennon, was that they consciously used the words "I," "you," "we," "me," in order to speak directly to the listener. Another reason is that the overarching theme of their entire body of work in the Beatles is love, peace, understanding, and hope. Sure, they also have songs that are angry, sad, melancholy, and so on...this is real life and they are, like all of us, only human. But overall, the message was one of overwhelming positivity and listening to their music is always a joyous, uplifting experience. On a personal level, their songs have brought me immeasurable joy and continue to do so. When I'm happy, I enjoy listening to them, and when I'm sad and upset, I always feel better when I listen to some Beatles songs. Lennon and McCartney also inspired me to start trying to write my own songs when I was around thirteen. I'd only been playing guitar for a few years at that point (again, the Beatles were one of the reasons I started in the first place) and while my first efforts were quite clumsy and derivative for the first few years, by learning their songs, deconstructing them, and using them as inspiration, they set me on the path to writing good songs (which started around the time I was seventeen). The fact that their songs continue to resonate with me and millions around the globe 44 years (and counting) since they broke up should be all you need to know why they are at the top of the heap when it comes to 20th century popular music songwriters. Click here for PART 2 on Ray Davies! Not a fan, but Bob Dylan definitely belongs in the top 3. I'm not a fan but I respect Dylan's ability as a lyricist. As a songwriter he's never done much for me...my favorite Dylan songs tend to be when other people cover them! I love the Beatles, and Paul's solo career, until the late 80's - he has lost it as far as Im concerned, nothing since has caught my fancy - whereas Ray Davies gets better and better with age. I do agree that Paul hit a rough patch from the mid-80s onward but his late-career renaissance that started with Flaming Pie in 1997 has been great. Apart from Driving Rain which is a bit of a weak album, his albums have been really good!